Helenton Mote is a medieval earthwork motte, with an irregular square-topped summit. Sited on the edge of an escarpment overlooking the Pow Burn, a small oval knoll, forms the basis of the circular motte. To the west and south, the mound and any possible ditch have been slightly truncated by the road and house. There is no trace of a motte ditch to the north and east either, only an old mill pond which is now low boggy ground. In the mid 19th century, it was recorded that the summit of the motte, which is now covered by trees and vegetation was crowned by a ruin. A mile north-east is Craigie Castle and 2 miles south-east is Barnweill Castle. 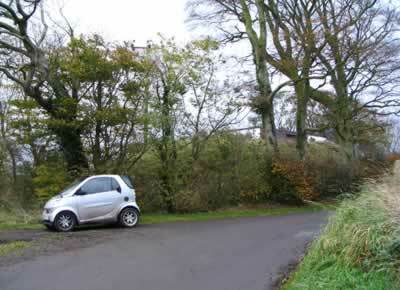 Helenton Mote is located east of Symington, off the A77. 5 miles south-west of Kilmarnock, on the A77.